The global healthcare IoT security market consists of a multitude of companies catering to different needs within an IoT security environment. The broad segments, the market could be defined under are: healthcare IoT security solutions, and healthcare IoT services. The healthcare IoT services are further defined under: consulting services, risk assessment services, design and integration services, and managed security service, among others. Moreover, the healthcare IoT solutions are further defined under: network security, endpoint security, cloud security, application security, and content security, among others. Healthcare IoT services is the leading segment contributing to 61.32% of the overall market in 2018. The healthcare IoT services market is primarily driven by increasing connectivity of healthcare IoT devices with the caregivers, increased proliferation of cybercrimes in healthcare, and increased data privacy and security concerns among consumers. The purpose of this study is to gain a holistic view of the global healthcare IoT security market in terms of various influencing factors, such as regional adoption trends, key developments, among others. The scope of this report constitutes of an in-depth study of the global healthcare IoT security market, including a thorough analysis of the products across different regions. The market has been chiefly segmented into ‘solutions and services’ and ‘region’. The report presents the reader with an opportunity to unlock comprehensive insights with respect to the market and helps in forming well-informed strategic decisions. The research uncovers some of the substantial parameters that must be taken into consideration before entering into the market. This research report aims at answering various aspects of the global healthcare IoT security market with the help of key factors driving the market, restraints, and challenges that can possibly inhibit the overall market growth and the current growth opportunities that are likely to shape the future trajectory of the market expansion. The report includes an in-depth examination of the key ecosystem players and key strategies and developments taking place in this market. In addition, the report includes market dynamics (market drivers, opportunities, and challenges) and industry analysis. The research study consists of patent analysis, opportunity matrix, detailed product mapping, and growth share analysis by products and by region. • What are the IoT-enabling technologies in the healthcare IoT market? • What are the key applications of the healthcare IoT? • What is the healthcare IoT ecosystem and healthcare IoT security architecture? • What are the key reasons to focus on healthcare IoT security? • What are the major market drivers, challenges, and opportunities in the global healthcare IoT security market? • What are the underlying structures resulting in the emerging trends within the global healthcare IoT security market? • How is each segment of the global healthcare IoT security market expected to grow during the forecast period and what is the anticipated revenue generated by each of the segments by the end of 2028? • What are the significant developmental strategies which are implemented by the major players in order to sustain in the competitive market? • Who are the leading players with significant offerings to the global healthcare IoT security market? • What is the expected compound annual growth rate (CAGR) to be witnessed by the leading players in the market during the forecast period 2019-2028? Which healthcare IoT solutions are anticipated to have the most promising growth? • Who are the key manufacturers in the global healthcare IoT security market? • What is the growth potential of the global healthcare IoT security market in North America, Europe, Asia-Pacific, and Rest-of-the-World? The key players which have been contributing significantly to the global healthcare IoT security market include Cisco Systems, Inc., DELL Corporation, IBM Corporation, Intel Corporation, Checkpoint Software Technology, Trend Micro, Inc., Oracle Corporation, Symantec Corporation, and ATMEL Corporation, among others. 5.2.3.5 Why is IoT Network Security Crucial? 5.2.4.5 Why is IoT Endpoint Security Crucial? 5.2.5.5 Why is IoT Content Security Crucial? 5.2.6.5 Why Is IoT Application Security Crucial? 5.2.7.5 Why Is IoT Cloud Security Crucial? 6.2.5 Why are IoT Consulting Services Crucial? 6.3.5 Why are IoT Risk Assessment Services Crucial? 6.4.5 Why are IoT Design and Integration Services Crucial? 6.5.5 Why are Managed Security Services Crucial? The global healthcare IoT security market is a huge market comprising the companies catering to different needs of security for IoT devices. Some of the broad segments the market could be defined under are: Healthcare IoT security solutions, and healthcare IoT security services. Healthcare IoT security services is the leading segment contributing to 61.32% of the overall market in 2018. In 2018, global healthcare IoT security services market was estimated to be $571.8 million and is expected to reach a value of $16,305.1 million by the end of 2028. The market is primarily driven by increased data privacy and security concerns among consumers. The market segment comprises a broad range of services such as consulting services, risk assessment services, design and integration services, and managed security service, among others. The overall healthcare IoT security market has been witnessing a steady growth. The market is expected to continue to grow with a double digit CAGR of 41.38% during the forecast period 2019-2028. Just like the healthcare IT industry, cloud storage has always been the paramount factor for success in the global healthcare IoT security market. However, lack of technological awareness about IoT threats among healthcare organizations, and lack of one standard IoT regulation are some of the challenges that are hampering the steady growth of the market. 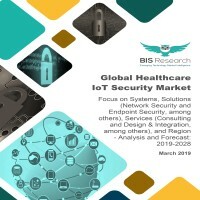 The purpose of this study is to gain a holistic view of the global healthcare IoT security market in terms of various influencing factors, such as regional adoption trends, and key developments, among others. The scope of this report constitutes of an in-depth study of the global healthcare IoT security market, including a thorough analysis of the products across different regions. The market has been chiefly segmented into ‘solutions and services’ and ‘region’. The report presents the reader with an opportunity to unlock comprehensive insights with respect to the market and helps in forming well-informed strategic decisions. The research uncovers some of the substantial parameters that must be taken into consideration before entering into the market. The global healthcare IoT security market comprises four distinct regional markets: North America, Europe, Asia-Pacific, and Rest-of-the-World. In 2018, North America was estimated to be the largest regional segment with a value of $435.7 million and is anticipated to reach $11,383.1 million by the end of 2028. North America leads the global healthcare IoT security market in 2018. Increase in healthcare expenditure, growing geriatric population, and increasing proliferation of cybercrimes in healthcare promote the growth of healthcare IoT security market in North America. The key manufacturers who have been contributing significantly to the global healthcare IoT security market include Cisco Systems, Inc., Inside Secure SA, Dell Corporation, Intel Corporation, ATMEL Corporation, Symantec Corporation, EUROTECH SPA, Fortinet, Inc., Oracle Corporation, and Deutsche Telekom AG, among others.